I LIKE IT SIMPLE. Grey t-shirt and a skull scarf. You remind me of Daria Werbowy in the last picture, stunning! 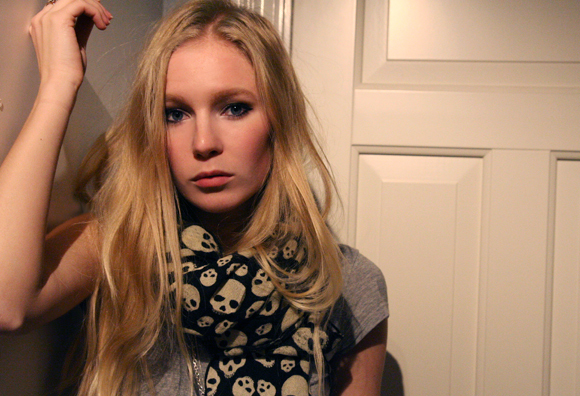 i need a skull scarf!! i love your blog! Love the simplicity. Don’t ever dye your eyebrows! I love the blonde! You look great in simple. And your cheekbones are perfection!! You look absolutely stunning in the pictures, love the scarf. Very nice. I’ve been drawn to grey tshirts lately… kind of odd! I want a suuuper soft one that fits like a dream, that’s all, haha. scarfen var sketafin. Du är fin du med. is the skull trend making a comeback? Du är såååå vacker!!! naturligt vacker. It’s clear and simple I like it. way too beautiful är allt jag har att säga. Oj haffade också den sjalen häromdagen, sjukt fin! ÅH sjukt snygg sjal! Snälla berätta vart man kan hitta den? OMG! As you said… Simple and beautiful too. You have such a pretty smile. love the photos…so fresh and cute:)and your scarf is one i want too…where did you get it??? even though halloween’s long gone, i’m still obsessed with sculls. you work this scarf perfectly! care to trade links?